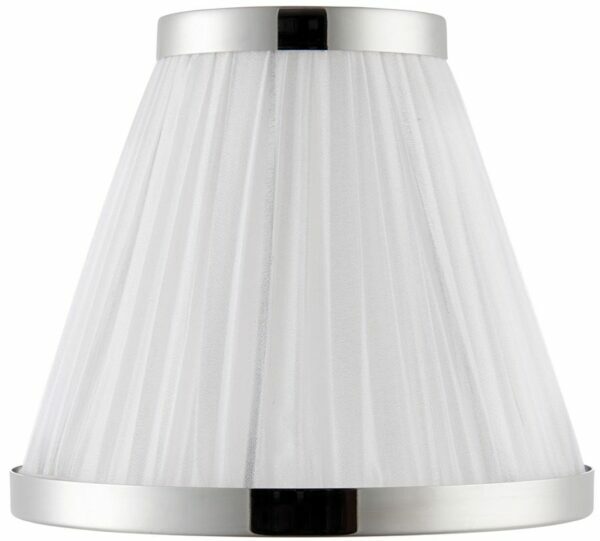 The Suffolk white faux silk 8-inch lamp shade with polished nickel frame is suitable for small table lamps. Height 15.5 cm, base diameter 19 cm, top diameter 10 cm. Maximum 60w lamp. A quality lamp shade, hand crafted from organza fabric and fitted with a fixed polished nickel gimbal, suitable for BC-B22 and E14-SES lamp holders with shade ring only. The Suffolk white faux silk 8-inch lamp shade with polished nickel frame from Interiors 1900.